While playing the new game “Break Guns Using Gems!” you try to do exactly that: breaking guns using gems. And you have to be very quick to make it far. Let’s rush forward! 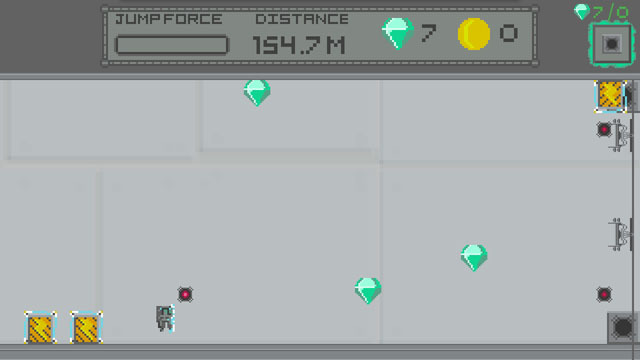 In this game you control a little robot and collect coins and green gemstones while avoiding obstacles and missiles. There are two versions of this endless runner: an endless mode and a customizable playground. The latter is one of the main qualities of this app. 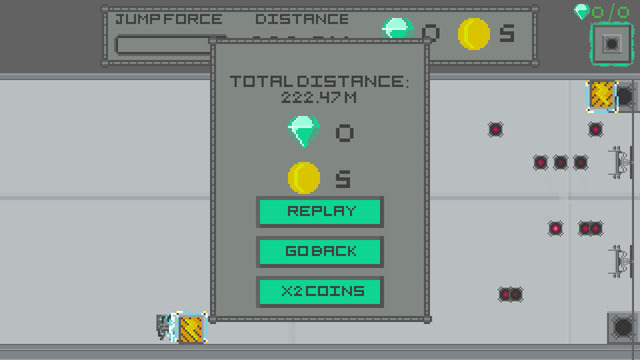 It is so much fun to try all of the numerous options like gravity impulse, bullet speed and jump impulse. I’ve hadn’t had the opportunity of doing that before, therefore I had a great time playing around. Together with the fitting music and sounds and an unobtrusive ad-placement this game has great strong points! But where is light, there is shadow. But they aren’t very dark, thankfully! However, I would love to see an easier start for beginners. The difficulty of this game is so high, that I could hardly make any progress. This frustration could deter new players. So I would like to see a steadily increase of challenges. Maybe one of the sources of my difficulties are the control mechanisms. While I like the concept of them, I feel they aren’t refined or sensitive enough. Sometimes the robot was reacting promptly, sometimes it didn’t react at all or too late even when using the same amount of pressure or holding time. Some tweaking could make them a bit better! Lastly, I think it would be an additional bonus to have one or two saving slots for the playground customization options. This way, I don’t have to write down my favorite preferences, when playing around with the settings even further. If you want to try out this challenging, but fun game, download the app here.